The more I investigate ethical fashion, the more I realise that everything is connected and occasionally this interlocking web reveals something truly worth talking about. At The Good Fashion Show several weeks ago, I met Emily Huc who designs ethical lingerie label, In Bloom London. With a background in international development, Emily previously worked with farmers in Costa Rica and saw, first-hand, how sustainable processes could positively affect their everyday lives. She craved a more creative outlet however, and dreamt of establishing her own clothing label. Making lingerie environmentally and skin friendly seems logical yet there is precious little on the market in terms of ethical design. Emily saw the potential for a range of sustainable lingerie and set to work, designing, sourcing suppliers and finding manufacturing facilities. Barely 6 months old, her first collection comprises a delicate and comfortable organic cotton range in white, pale pink and teal. Lingerie is difficult to manufacture, and like most clothing, has been long outsourced to far-flung destinations outside of Europe. Emily managed to find a family-run factory in Northern France with expertise in corsetry, to guarantee excellent quality results. All of the fabrics and trimmings are certified Oeko Tex 100, which is the highest safety standard for textiles, and the cotton is certified organic by GOTS. A lot of people ask me where to shop, to avoid buying unfairly traded or sweatshop manufactured goods, without really having to think too much. Thankfully Emily provides at least one answer! 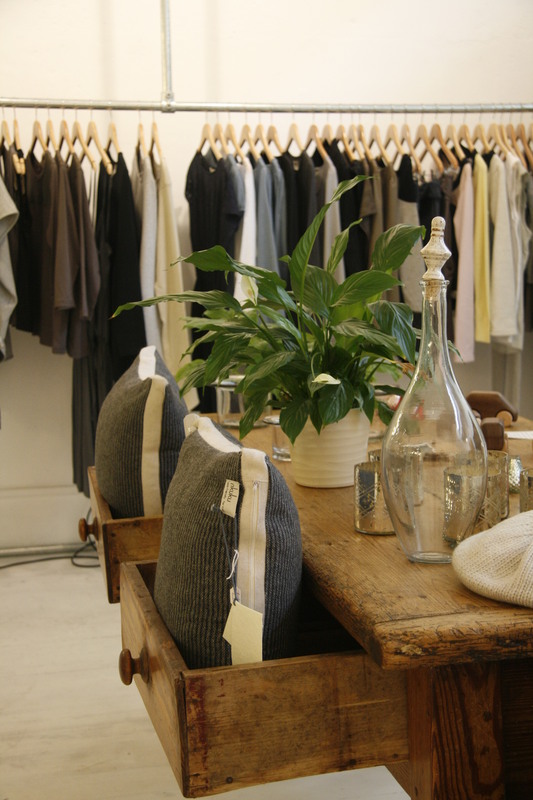 She operates an ethical concept store in west London under the same name, In Bloom London, stocking her own lingerie label and a host of other goodies, ranging from clothing to jewellery, furniture and interiors. With more than a hint of Parisian charm, the store steps away from the hippie craft aesthetic that is often associated with ethical products to become a much more refined shopping destination. Nestled under the bridge on Portobello Road, In Bloom London is perfectly positioned to attract the Notting Hill set as well as Saturday shoppers at the bustling market. Emily and I spoke about the need for more “beauty” in the ethical industry. We agreed that it is very difficult to find ethical brands that can compete with non-ethical labels, on aesthetics and price points, yet still maintain their agenda. So often, I cringe at the products offered by ethical designers who focus solely on the substance and not on the style. For Emily Huc and her In Bloom boutique, the aesthetics must be right. She’ll soon be moving to the unit next door and is beginning to take deliveries of Spring/Summer 2012 stock. New collections from L’herbe Rouge, Nancy Dee and Goodone will be shortly appearing, along with jewellery from Kokku (featured here). If you would like to see for yourselves, go to the Portobello Green Designers Arcade, at 281 Portobello Rd (under the bridge), London. The In Bloom London lingerie range can also be purchased online here. This entry was posted in Ethical fashion, Lingerie, Sustainability and tagged clothing supply chain, concept store, Emily Huc, environmentally friendly, ethical fashion, In Bloom London, intimates, lingerie, luxury, organic cotton, Portobello Green Designers, sustainable. Bookmark the permalink.